Two young boxers from SGS College faced some of the country’s toughest competition at the National Boys and Girls Club Championships at the end of 2015 – with one coming away as champion. 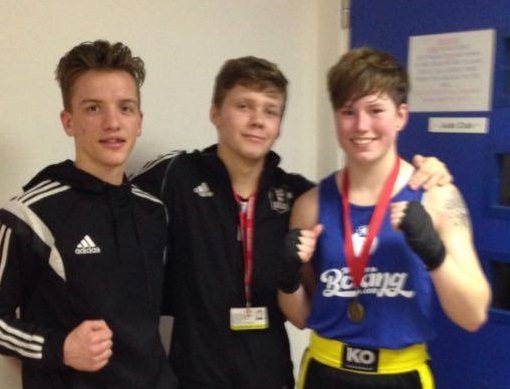 Jacob Croot and Natalie Craig travelled to Croydon at the start of December to vie for titles, with Natalie returning to Bristol as Class C U64kg Female national champion, while Jacob narrowly missed out on victory in his match. Jacob met Hoddeston’s multiple national champion, the hard-punching Charlie Kenny. Jacob opened with some superb boxing, scoring well as Charlie came forward. But Charlie caught Jacob with strong shots, prompting a protection count from the referee. Natalie faced tough Hartlepool boxer Coran Grayson. She opened her account with fast straight shots, with fierce competitor Coran coming forward aggressively. The pattern continued throughout the contest with Natalie’s straight punching forcing two standing counts from the referee. In the corner with Advanced Apprenticeships in Sporting Excellence (AASE) boxing coach Craig Turner was 18-year-old AASE boxer Adam Arkell. Adam passed his level 1 coaching award last year at SGS, and while still competing has begun his coaching career.